Relax: Trump Tweets That North Korea Won’t Nuke U.S.
North Korea regularly threatens to attack the United States with nuclear weapons, and experts say it’s possible they’re making progress on their long-stated goal of developing that capability. 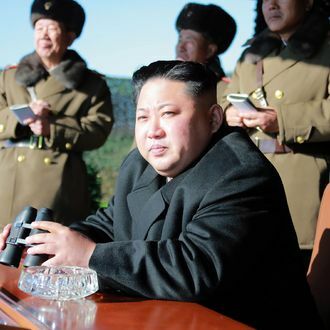 North Korea has never flight-tested an intercontinental ballistic missile, but they have conducted five nuclear tests in the past ten years, as well as more than 20 ballistic-missile tests in the past year. The Obama administration condemned this latest bit of saber-rattling. “We call on all states to use every available channel and means of influence to make clear to the [Democratic People’s Republic of Korea] and its enablers that launches using ballistic-missile technology are unacceptable, and take steps to show there are consequences to the DPRK’s unlawful conduct,” State Department spokesman John Kirby said. That’s not exactly what Kim Jong-un said (he claimed they’re close to testing an ICBM, not a nuclear-tipped ICBM). But Americans don’t need to sweat the details because that simply won’t happen. The tweet did not elaborate on Trump’s plan to prevent North Korea from developing nuclear weapons that can reach the U.S., and during the campaign he wasn’t very clear on his policy toward the rogue state. Trump has called Kim Jong-un a “bad dude” and a “maniac,” but he also said “you have to give him credit” for his brutal rise to power, and that he’d be willing to meet with him. At other points, Trump said South Korea should pay more for U.S. protection, and suggested that he’d be open to South Korea and Japan having their own nuclear weapons. China disputed this, saying in a state-run tabloid that Trump is “pandering to ‘irresponsible’ attitudes.” The Global Times newspaper also said Pyongyang’s nuclear program “stokes the anxieties of some Americans” who blame China rather than examining their own nation’s actions. Still, there’s no denying that this is pretty encouraging news about the global threat posed by North Korea (if you get all your information from the president-elect’s tweets).